The Table of the Lord is the table of His body, and His body is one. At His table, we all eat of the one bread and drink of the one cup. We do not just partake of Him individually, but together as His body. No matter where we are geographically, we all share in communion with Him, and therefore with each other. We have this communion not only with those of His body who still walk this planet, but also with all the saints who have lived since the beginning of the Church. The Table of the Lord is the sign of this unity. When I was young, I used to see an old cartoon, which featured a number of vignettes. One of those scenes showed a mailman sorting mail. In this cartoon world, this mailman was actually an octopus, busily sorting the mail into a wall full of slots. It was funny enough watching the him going at it with all eight tentacles, but then we were shown that, on the other side of the wall, all the slots emptied into one mail pouch. Sometimes I think about that at the Table of the Lord. We all take of the bread and the cup, each of us “sorting” it into our own individual mouths — but then, behind the scenes, it all enters into the same body, the body of Christ. In the passage above, Paul speaks of the unity we have in Christ, and how we shall walk in view of it. We should be humble, gentle and patient with each other, even putting up with each other for the sake of love. This is the mind of Christ for the body of Christ. All those who come to faith in Jesus Christ are made one in Him. We are His body. We see this in the Table of the Lord, the Table of Union with Him. Years ago, I wrote a little song about the Table of the Lord and the unity we have in Him. It’s called “Celebration” and you can listen to it in streaming MP3. 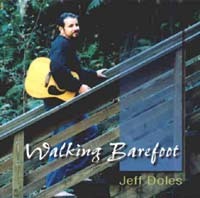 It's from our first CD, Walking Barefoot.